a research facility where studies are conducted on key topics relating to PV system performance and design. To this end, the site includes various PV system design configurations that can be easily modified or re-wired to serve different purposes. A custom monitoring and data acquisition system provides live data logging and archiving capabilities for education and research. Solar radiation is measured adjacent to the site with a state-of-the-art rotating shadowband radiometer. Temperature, rain, wind speed and other weather related variables are monitored at a nearby meteorologic station. 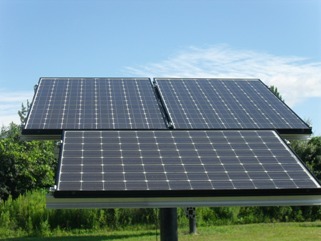 In addition to the on-site arrays, the Kortright Centre hosts a number of other solar installations. These include PV arrays installed on neighbouring buildings, solar shingles, solar thermal and solar air demonstrations, as well as one of the oldest PV installations in Canada. The neighbouring Earth Rangers Centre generates electricity from a 28 kW fixed roof array and a 58 kW dual tracking array.